Whether you need chemotherapy, radiation therapy, surgery, or a combination of cancer treatments, you can get the care you need in one comfortable, convenient place close to home. The cancer team at Doctors Hospital uses advanced medical technology and the same treatment protocols used at the nation's leading cancer institutes. Chemotherapy uses anticancer drugs, taken orally or through an infusion into a vein or artery, to kill cancer cells. It can increase the chance of survival by destroying cancer cells that cannot be removed by surgery. All intravenous drug therapies are prepared on site by specially trained pharmacists and are given by skilled nurses. Chemotherapy can be provided on an outpatient basis or as an inpatient in the hospital. In addition to chemotherapy, your doctor may recommend a blood transfusion or a biological, hormonal or immunotherapy medication as part of your treatment plan. Over the years, chemotherapy has evolved to minimize negative side effects. Patients may experience nausea, diarrhea, pain, hair loss, sadness and fatigue after receiving treatment. Because every patient is different, your medical team will develop a treatment plan that’s catered to your physical and medical needs. Radiation therapy involves a brief exposure to high energy X-rays to eliminate cancer cells while sparing the surrounding healthy tissue. Radiation is typically used after surgery to kill any remaining cancer cells and prevent the cancer from returning. Often given on a daily basis and combined with chemotherapy, side effects of radiation can include hair loss, fatigue and skin irritations in the area receiving treatment. 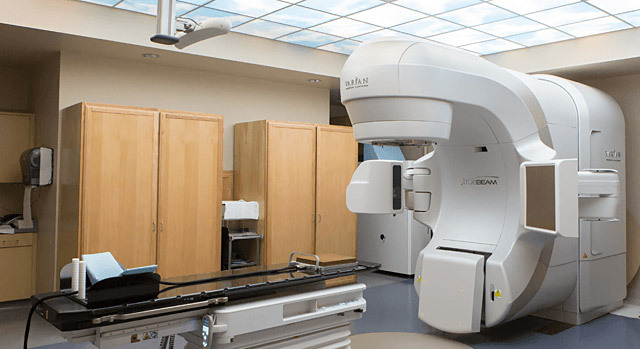 The cancer team at Doctors Hospital uses the TrueBeam™ System, which combines imaging with radiotherapy, to allow for quick, more accurate radiation treatments. With the TrueBeam technology, doctors can better monitor for tumor motion to protect healthy organs and tissue. The machine provides a comfortable experience for patients who can use the built-in music capabilities and talk with the radiation technician throughout the process. The TrueBeam System can be used for lung, breast, liver, abdomen, head and neck and other cancers. 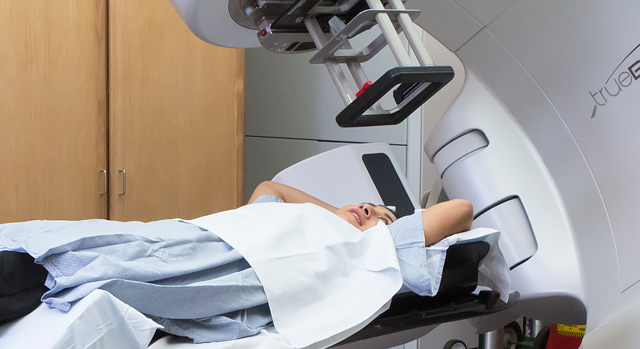 For lung and other tumors that affect the respiratory system, TrueBeam offers Gated RapidArc® radiotherapy, allowing the patient’s breathing to be monitored while radiation is delivered continuously as the machine rotates around patients.